Penny is an e-cig manufacturer that recently crossed our radar, with several new products that we thought were worth sharing. 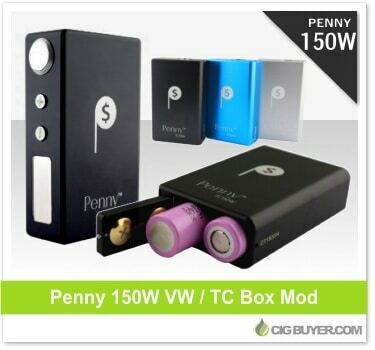 The latest, the Penny 150W Box Mod, offers up to 150W of power with temperature control. Powered by dual 18650 batteries, it comes in several attractive colors and includes a large OLED screen, adjustable brass 510 center pin and (what appears to be) and a quick-release battery door on the bottom. It looks similar to the Sigelei 150W Mod, but with a softer style and rounder edges.